Marie Dennis is a real ‘peace promotor’, so she deserves this Prize. Persistently but gently she fosters reconciliation, peace building and conflict transformation through active non-violence. All the quotes, published above, speak of her appreciated capacities: no doubt she is a worthy candidate! Marie Dennis deserves this recognition. She is a true inspiration; she is gentle and humble, yet she has this inner and outer dynamism that truly inspires others to be dedicated peacemakers! Her love and care for humanity and our Earth home can be seen in all aspects of her life! Marie Dennis is very deserving of this prize. Her disarmament efforts as Head of Pax Christi International are exemplary. Marie is an amazing woman and an unstoppable force for peace. I have been honored to know her to work with her briefly. Marie richly deserves this nomination. She IS what she believes and speaks of in all aspects of her life. Her example as a true peacemaker is an inspiration and encouragement to all who come into contact with her. 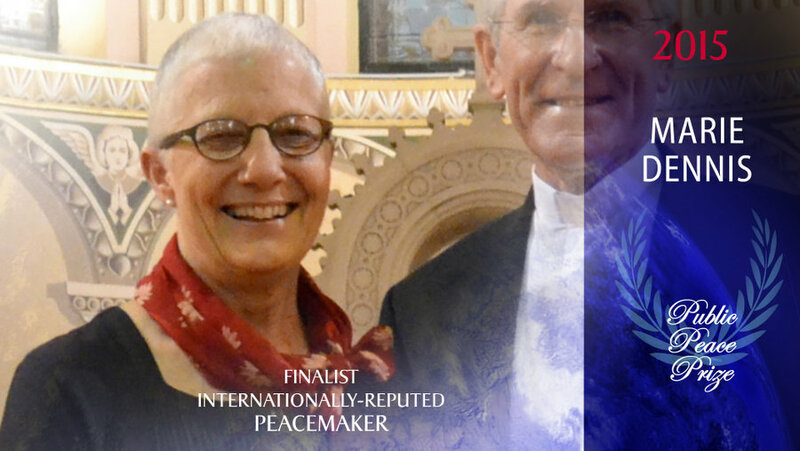 Marie Dennis would be a really deserving winner of this award – her life has been dedicated to promoting just peace and reconciliation throughout the world. Inspired by the Christian Gospel with its message of non-violence, she not only writes and speaks widely, she has also visited some of the world’s worst conflict areas as a member of several peace delegations. We have only met her once, when she spoke locally about the peace witness of Archbishop Oscar Romero, but she is clearly a woman in whom contemplation and action bear rich fruit. She is a great person, Good speaker and has worked for peace and justice for a very long time, She is very deserving to be a winner of this award. Even if she does not get it, she is a winner to all the people whom she has touched in her journey throughout this world of ours. She is a living word! Marie Dennis is a woman of faith who lives and risks the Gospel. She is a model of nonviolence for our time. This award belongs to her. I have known Marie Dennis for thirty years and can vouch that she is a woman of great integrity, wisdom and courage. Marie’s voice is gentle but her words are clear and strong, based on knowledge, conviction and her faith values. She is Peacemaker par excellence in word and action. I appreciate the work of Marie Dennis especially in her efforts for peace. She is most deserving of this prize.